was born in Bremen in 1948. She studied painting, music (flute and composition) and electronics in Hamburg, Graz, Zürich and Milano, where she graduated. After having worked as a flutist for contemporary music she started to perform her own pieces, often combined with video. Since the end of the seventies she focussed on sound installations, sound sculptures and work with light. Her compositions are mostly electroacoustic, but she has written for ensembles as well and has produced several audio works for radio. Numerous grants and awards, such as the Award of the German Industrial Association (BDI), composition grant of the city of Berlin, Carl Djerassi Honorary Fellowship,California, IASPIS residency grant, Stockholm, Honorary award from the German sound art award 2008, ars electronica honorary mention 2008,SR media art award 2010, sound city artist Bonn, Beethovenstiftung 2013. Since 1974 solo exhibitions in Europe, USA, Australia, Japan and South America. Numerous participations in international festivals and group exhibitions such as: Pro Musica Nova, Bremen 1976 and1980, Für Augen und Ohren, Berlin 1980, Biennale of Venice, 1980 and 1982, Gaudeamus Music Festival 1984, documenta 8, Kassel 1987, Ars Electronica, Linz 1987, Steirischer Herbst, Graz 1987, Biennale of Sydney 1990, Donaueschinger Musiktage, 1993 and 1997, Prison Sentences, Philadelphia 1995, Sonambiente, Berlin 1996 and 2006, in medias res, Istanbul 1997, festival d’art sonor, Barcelona 1999, Sonic Boom, London 2000, Visual Sound, Pittsburgh 2001, Singuhr-Hörgalerie, Berlin 2002, activating the medium festival, San Franciso 2003, sounding spaces, Tokyo 2003, Musik und Raum, Lucerne Festival 2004, Resonance – The Electromagnetic Bodies Project, ZKM, Karlsruhe 2005, Her Noise, South London Gallery, London 2005, Stockholm New Music 2006, Sound/Bytes, Oldenburg 2007, Mois Multi, Quebec 2008, International chamber music Festival, Witten 2009, Tonspur, museum quarter Mq21, Vienna 2009. RUHR. 2010, cultural city project, White Walls have Ears, Sound Art ZKM Karlsruhe 2012, bonnhoeren, Beethovenstiftung 2013. Her music has been released with various labels such as Cramps Records, Edition RZ, ampersand, semishigure, Die Schachtel, Olof Bright, AA Records, Important Records and others. Christina Kubisch has been a visiting professor in Maastricht, Paris, Oxford and Berlin. From 1994 to 2013 she was professor for audiovisual Art at the Academy of Fine Arts, Saarbrücken, Germany. She is a member of the Akademie der Künste Berlin since 1997. Christina Kubisch lives in Hoppegarten near Berlin. 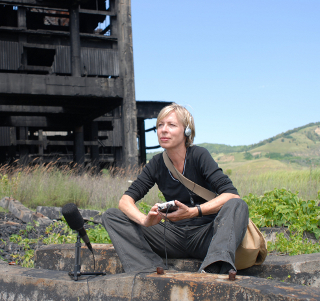 Christina Kubisch belongs to the first generation of sound artists. Trained as a composer, she has artistically developed such techniques as magnetic induction to realize her installations. Since 1986 she has added light as artistic element to her work with sound. Christina Kubisch’s work displays an artistic development which is often described as „synthesis of arts“ – the discovery of acoustic space and the dimension of time in the visual arts on one hand, and a redefinition of relationships between material and form in music on the other.